Bitcamp season means they want to build something weird again, woohoo! This time, Gurpreet initiated the project and got me onboard to help with design and do technical direction and logistics. Gurpreet's idea was to facilitate a collaborative hardware project that everyone at Bitcamp could contribute to. This ended up manifesting itself as a blank white tree, a canvas which people could paint and build on. I put together this design in Sketchup and pitched it to him. The design consists of large central trunk column, eight primary branches extending off of the trunk, and two secondary branches extending from the ends of each of the primary branches. These 25 pieces can break apart for easy(ish) transportation. 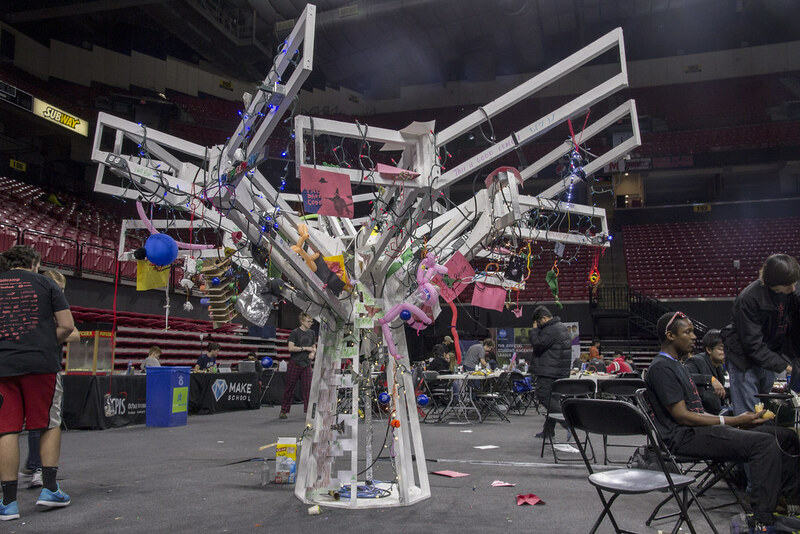 The tree also featured 50 power outlets (38 usable because some were used to connect sections together) scattered around it, so participants could incorporate electronics into their contributions. For more pictures, including lots of images of what Bitcamp hackers added to the tree, check out this Flikr album. Here are videos Gurpreet made!